When tech billionaire Benjamin Bennett returns home for his cousin’s wedding, a passionate weekend with his former crush—his older sister’s best friend, Sloane Sutton—results in twosurprises. But can he get past Sloane’s reasons for refusing to marry him for the twins’ sakes? When wealthy rancher Diego Velasquez donates one night to the highest bidder, he’s bought by a nanny! But after one fiery encounter, beautiful Pippa slips away, driven by secrets she can’t reveal. Now this Texan vows he’ll learn the truth and have her back in his arms! 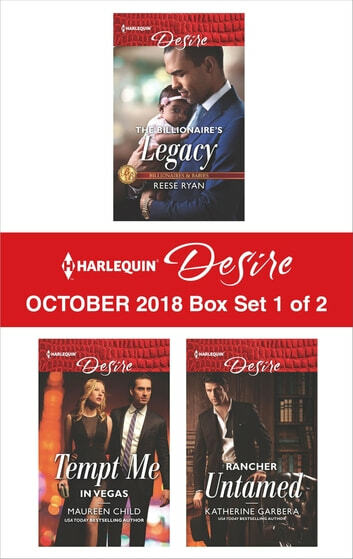 Look for Harlequin® Desire’s October 2018 Box set 2 of 2, filled with even more scandalous stories and powerful heroes!